The objectives of ZIP Initial Training Network are simple. We aim at training a new generation of geoscientists providing them, through dedicated multidisciplinary supervision and training programs, with broad, high-end scientific expertise, up-to-date laboratory facilities and a solid cross-disciplinary basis, thereby enabling them to tackle ZIP scientific challenge and pursue new supradisciplinary scientific orientations. (3) constrain how rock rheology, control seismicity, mega-earthquake nucleation and rupture propagation. ZIP hired and trains 12 early-stage researchers (ESRs) and 2 experienced researchers (ERs) from 10 nationalities (6 women and 8 men from Italy, Croatia,Belgium, France, Germany, Chile, China, Switzerland, Greece, Netherlands) to become Europe’s future scientific or science manager leaders from leading Universities and Research Centers spread across Europe (France, Germany, Italy, Spain, Switzerland, Greece) and 9 Industrial partners. Private sector involvement provides the fellows with the opportunity to experience the organization and work of large industries, and increases employability of the 14 fellows involved. ZIP offers some hands-on innovative training initiatives (ZIP Starters and Consolidator) to ensure broad and in-depth scientific coverage, set up their future research, establish a common language and approach, as well as launching group dynamics and promoting strong intersectoral interactions and strengthen group cohesion: (1) acquisition of geophysical data at sea on the active European/Mediterranean subduction interface, (2) field investigation of a fossil, exhumed subduction plate interface monitoring of an active Andean subduction interface which hosts the largest earthquakes and radiates most of the seismic energy releaseon Earth at present. ZIP Network endeavor is now half-way through, and running enthusiastically. Almost all our dedicated training is over out of and has given rise to numerous interactions both in terms of scientific education and research. 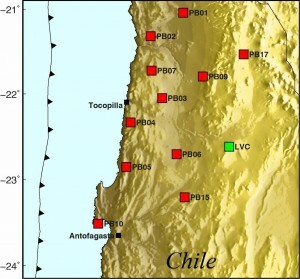 (1) Seismic imaging, continuous monitoring by GPS and earthquakes record: Modern geodetic tools applied to the latest major earthquake in Chile (Mw 8.3, September 2015) and recent mega-earthquakes (2010-2014) suggest that identifying present day, mechanically coupled areas between tectonic plates is more relevant to quantify seismic hazard than recurrence times inferred from historical records. Detectable transient deformation from recent Chilean earthquakes also provided interesting clues to the everlasting questions: why here, why now… and when next? Detailed imaging is more crucial than ever, and the first joint wide-angle and multi-channel tomographic inversions were obtained for northern Chile in the seismic gap area by jointly using land and marine data. Deeper down, analysis of the time-space distribution of ~120 km deep clusters of seismic events allowed to precisely locate seismicity at the top of the sinking plate in the Mediterranean (European) subduction zone. Risk assessment after large Mediterranean earthquakes is being studied through seismological observations on historical, tsunamigenic portions of the Hellenic subduction interface and models of seismic, frictional instabilities. (2) Field evidence and geochemical fingerprinting: The impact of metamorphic fluid release and infiltration on the generation of deep earthquakes is being studied across a > 10 km long serpentinite-rich strained zone exposed in the Alps within a thick (complete) slice of oceanic lithosphere subducted to 80 km depth. This “frozen-in” earthquake record in highly brecciated rocks demonstrates a strong lithological control on the size and distribution (recurrence) of rupture planes, with transitions within a few meters from intact to crushed bodies. Complementary structural work on the Chinese Tianshan fossil plate interface documents deep accretionary processes responsible for the scrapping of sediments along the subduction interface, before melting occurs, at depths where serpentinite minerals dehydrate. The features produced by serpentinite dehydration during plate burial at depths of 80-120 km, also investigated through intensive field and mineralogical mapping, reveal pulsating, temporal sequences of fast, high flux dehydration events (ca. 1 year) alternating with slow ones (ca. 20 yrs.). Finally, a new analytical method was developed to constrain fluid composition and subduction chemical cycling via nanoparticulate pressed powder pellets: refined measurements of major and trace elements (down to concentrations of a few ng. g-1) can be reliably performed on strongly depleted rocks like serpentinites for diagnostic fluid-mobile trace elements such as boron and arsenic. 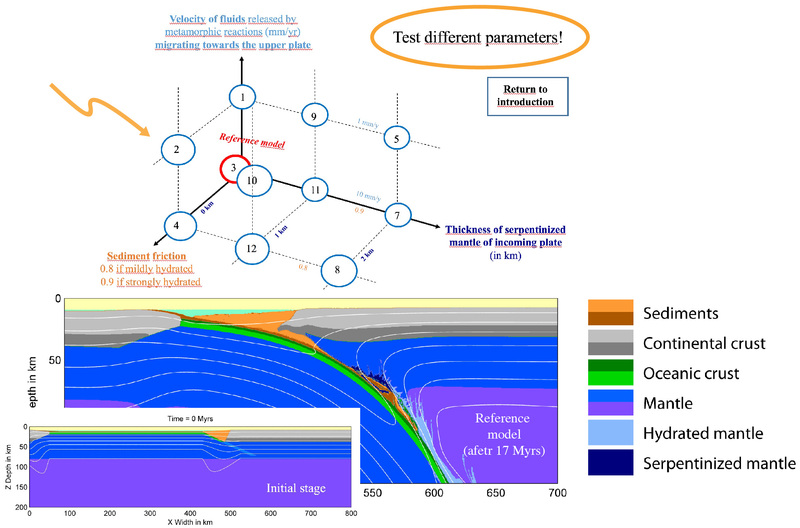 (3) Modelling and experiments: Models realized so far focused on (a) the impact of fluid-rock interactions and variable yield stress inside a sheared, deforming subduction interface using 2D hydro-mechanical modelling and realistic rock fracturing behaviours (with remarkable results matching recent experimental studies and geophysical observations); (b) understanding how crustal slices can be dragged, detached and exhumed along subduction zones due to lower plate mantle serpentinization (“Slicing of oceanic crust along subduction zones” is the first published ZIP paper) or how subducting seamounts may trigger gravitational instabilities, submarine mass-waste events and potential tsunamis. To bridge the gap between long-term geodynamic and very short time scales at which earthquakes operate, a massively parallel, flexible 2D and 3D seismo-thermo-mechanical visco-elasto-plastic numerical model of subduction was developed and benchmarked versus analytical and numerical solutions. Finally, earthquakes related to dehydration reactions accompanying plate burial were experimentally reproduced for the first time in the laboratory and detected by acoustic emissions! ZIP fellows are already taking an active part to the dissemination of their results by participating to international conferences (European Geosciences and American Geophysical meetings, Goldschmidt, Dice or Chapman conferences) and preparing ZIP final conference. All these results have a great potential impact and can be used in managing geohazards. This scientific effort is mandatory for risk assessment, to enhance the reliability of early-warning systems and help reduce human loss and economic costs. Educational outreach in vulnerable countries is also crucial to explain the seismic, tectonic and tsunamigenic processes both to politics and populations.With its first promising results, ZIP outreach activities are on a rising curve.